As a teenager, I’d often overstay my welcome at my best friend's house, not only for her esteemed company, but to sit at the table and eat generous helpings of whatever her Tuscan mother, Patrizia, was cooking next. A jar of homemade pistachio pesto in the fridge meant lunch or dinner was never far away and on weekends, the table would often heave with no less than three kinds of pasta: That same jar of pesto emerged from the fridge, a ragù simmered away, and a carbonara slid together, seemingly just like 'that', with a salad afterward, dessert later, and an amaro-spiked coffee to finish. It always seemed that these were dishes she just rustled up—and here’s where we get to the ‘How to cook pasta like an Italian’ part. Learning how to cook excellent pasta isn’t only about achieving ‘al dente’ and learning how to use pasta water, it’s a lesson in the boons of practical cooking: How to correctly use a few pantry ingredients to rustle up a feast—whether it’s using the pantry as the base for dishes of varying effort à la weekend Patrizia or it’s a weeknight pantry-raid pasta for two. Just think of plates of creamy cacio e pepe, silken carbonara, or spicy amatriciana—some of the greatest Italian pastas come together with the barest of long-life, household ingredients (dried pasta, hardy cheese, black pepper, eggs, pancetta, chili flakes, and tomato paste) and are proof that frugality does not preclude flavor. So, let’s open Pandora’s box of pasta making—it just so happens to be your pantry door! Before you begin, have you chosen the right pasta? The key measures here are size and texture. Will your sauce cling to it? Will it catch any chunkier pieces in nooks and crannies? A classic example of pasta choice gone wrong can be found in what many consider among the most Italian of dishes but is more of an export gone awry: Spaghetti Bolognese. Traditionally, a ‘ragù alla Bolognese’ is served with a long, thick pasta like pappardelle that the hearty sauce can really cling to. When you pair thin strands of spaghetti with a heavy, meaty sauce, you tend to end up with a lot of lonely sauce at the bottom of your pasta bowl. For the full lesson, catch up on our guide to pairing pasta shapes with sauces. To cook pasta properly, you need to use a large, tall pot filled with a lot of water. This prevents the water from becoming too starchy and ensures the pasta has enough room to cook without sticking to itself. Be prepared to use more water than you think you need—I usually eye up the amount, but Rome-based cookery writer and author, Rachel Roddy, recommends this local rule of thumb: 1 qt (1 L) for every 3.5 oz (100 g) of pasta. Only add your pasta when the water comes to a rolling boil—which brings us to the next factor to consider: salt. I was always taught to salt the water only once it reaches a boil, so to my knowledge this was the proper way. But wider reading tells me that Italy is firmly divided in this matter: Some argue that salting from the beginning makes the water boil quicker, while late-salters warn that it’ll corrode your pot. Since there’s no hard evidence for either, I will carry on salting as I do, once the water reaches a boil—but whichever way you do it, the important thing here is that you do in fact salt it, as the sodium really brings unseasoned dry or fresh pasta to life. “As salty as the sea” is often quoted as a measure, but don't go for mouth-puckering Dead Sea levels—usually a couple of tablespoons will suffice. It is possible to over-salt pasta though, so be particularly wary when preparing dishes where the pasta water will be added to pre-seasoned sauces like ragu, or will meld with other salty ingredients to create a sauce, like pecorino in cacio e pepe or pancetta in amatriciana. Al dente means ‘to the tooth’ in Italian—a degree of cooking that ensures a little chew to your pasta and makes for a more interesting, textured final dish. To achieve this, try removing the pasta about 1 – 2 min. before the advised cooking time on the package, or simply scoop out a piece or two to test before draining. Pasta water is integral to making virtually every pasta sauce, acting as a starchy base, thickener, and helping to create a glossy finish. Add it to loosen things up as you toss your pasta with pesto, create the sauce for cacio e pepe, to stretch out aglio e olio, or to add life to a dry ragu. Before draining, I always reserve at least one big mug-full of pasta water to splash into the final dish little by little until I’ve reached my desired consistency. 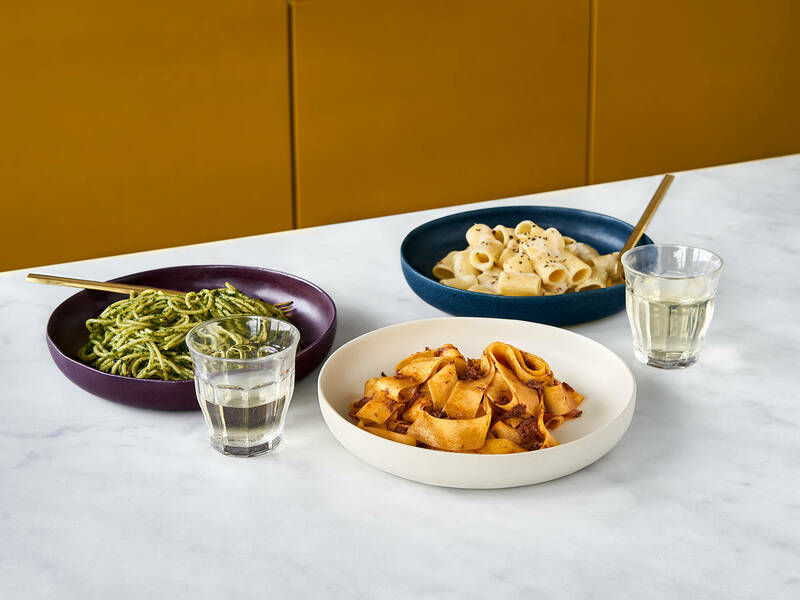 You can also reserve the pasta water when draining and transfer it to your serving bowl—perhaps the easiest way to warm the bowl before serving. Rather than topping cooked pasta with your chosen sauce, give your pasta a chance to really unite with the sauce by tossing it in as soon as you’ve drained it (but only after you’ve reserved your pasta water). The hot, starchy pasta will bind better with the sauce and absorb the flavor, creating a more well-rounded dish. Again, adding a little pasta water here helps it all come together. If you’ve got a little more time on your hands, you can also make fresh pasta with—you guessed it—regular pantry ingredients: eggs, flour, and water. The technique? Measure out your flour and/or semolina, make a well in the middle, and use a fork to whisk the egg and gradually incorporate the flour. Once you have a shaggy looking dough, get kneading. By hand it can take up to 10 minutes until you have a smooth, on-its-way-to-elastic dough. Once the dough has rested, you’ll need to knead it again and process it through a pasta machine—where the real fun begins. Whether you make tagliatelle or ravioli , the choice is yours, just note that you only need to cook fresh pasta for approx. 3 – 4 min. depending on the size and shape. Once you have these, you’re set to make anything from pantry-borne carbonara to amatriciana without having to leave the house. All these ingredients will help you form the basis of all other pasta dishes too—whether it’s a just-add-herbs pesto or a meat and vegetable affair for ragu. These are true pantry pastas that are the easy-on-the-wallet and heavy-on-flavor. Master the recipes, and you’ll only ever be a few ingredients away from a perfect pasta. These pastas may or may not require a quick dash to the shop for fresh ingredients, but they are by no means complicated. They are perfect for trying out all the steps outlined above—and are built on pantry staples. Have we answered all your pasta questions? Do you have your own favorite pantry pasta to share? Let us know in the comments!